(The structure of the pyramid itself has been tinkered with over time, for example by Manfred Max-Neef, who sees levels of subsistence, protection, affection, understanding, participation, leisure, creation, identity, freedom.) But the core insight remains: once basic levels of fulfillment are achieved, and as long as they remain achieved, we move up the hierarchy in search of broader fulfillment. 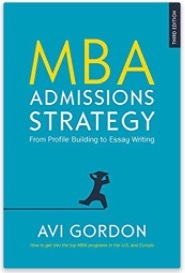 What does this have to do with MBA admissions essays, and how does this help those struggling with the MBA admissions goals essay question in particular? It helps because it provides a quick, reliable guide to the necessary reach of the essay. Too often applicants deal only at levels 2 and 3, talking of security and quality of employment, taking care of family (including elderly or immigrant parents) and developing friendship and contact networks, career progress, and so on. This is all important. But there is more to say, and Maslow shows the way to it. The rest of your motivation statement should be rooted in levels 4 and 5: how the MBA will take you activities that create self-respect, and the respect of others, what you will create, or solve or build, and why this will be self-actualizing at the highest level. a. Why are you pursuing a full-time MBA at this point in your life? b. Define your short and long term career goals post MBA. c. What is it about Chicago Booth that is going to help you reach your goals? d. REAPPLICANTS ONLY: Upon reflection, how has your thinking regarding your future, Chicago Booth, and/or getting an MBA changed since the time of your last application? “These short essays will require you to know yourself. You will need to understand where you have been and where you are going. Before you begin drafting the responses to these essays, take some time for self-reflection. Why do you want to return to school? Why is the MBA the right degree for you? “We know that many of you will use your MBA experience to help you figure out what kind of job to pursue next. Even though your future career plans may not be clear at this time, you should still be able to discuss your goals and how they relate to obtaining an MBA. 2. Chicago Booth is a place that challenges its students to stretch and take risks that they might not take elsewhere. Tell us about a time when you took a risk and what you learned from that experience (maximum of 750 words). 3. At Chicago Booth, we teach you HOW to think rather than what to think. With this in mind, we have provided you with “blank pages” in our application. Knowing that there is not a right or even a preferred answer allows you to demonstrate to the committee your ability to navigate ambiguity and provide information that you believe will support your candidacy for Chicago Booth. “Earlier this year, there was some discussion as to whether we would continue using the presentation as part of our evaluation process. With the presentation proving to be such an important tool in helping us determine who is a good fit for Chicago Booth, we decided it was necessary to include in our 2011 application. However, this year, we are giving applicants even greater freedom to decide what information they want to convey in the presentation. “Since we’re providing you with “blank pages,” what you decide to address in your presentation is up to you. Look at the other aspects of your application. Are there messages or activities that you have not yet been able to communicate to the committee? If so, then the presentation will be an opportunity for you to provide us with this type of information. After reviewing your presentation, we want to have a better understanding of who you are and how you think. So what is Rose saying? The essays tell her and her committee who among the applicants is unique, and why so, and (conversely) whether they will fit in. They demand you know yourself well, that is provide evidence of genuine self-reflection. They value risk-taking and the self-insight it brings. Like many other programs these days, Chicago-Booth doesn’t expect you to have a career blueprint, but does expect you to have thought carefully about your goals, and therefore why you need an MBA now. When it comes to the blank pages essay, Martinelli hasn’t said much, at least not yet. The core of it is clearly contained in the term “navigate ambiguity.” My take is Chicago-Booth wants to see what the applicant can produce in unguided, unstructured situations. Are you just good at following instructions (such as essay prompts); or are you even more capable? That is, can you determine and select compelling material to share with Adcom without any specific guidance. Can you set the agenda rather than merely follow it? 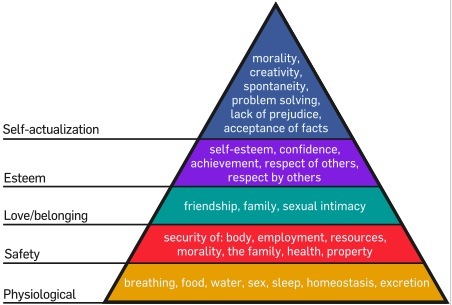 (The model made Maslow world famous. The structure of the pyramid itself has been tinkered with over time, for example by Manfred Max-Neef, who sees levels of: subsistence, protection, affection, understanding, participation, leisure, creation, identity, freedom.) But the core insight remains: once more basic levels of fulfillment are achieved, and as long as they remain achieved, humans moves up the hierarchy in search of fulfillment. What does this have to do with MBA admissions essays, and how does this help those struggling with the ‘why an MBA?’ question in particular? It helps because it provides a quick, reliable guide to the necessary reach of the essay. Too often applicants dwell in and around levels 2 and 3, talking of security and quality of employment, taking care of their family (including elderly or immigrant parents) and developing friendship and contact networks (incl. 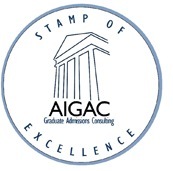 alumni networks), career progress, and so on. This is all important. But there is more to say, and Maslow shows the way to developing it. Where is the rest of your motivation going to come from in your life: how will you achieve further self esteem, self-respect, and the respect of others? What will you create? What will put you, personally, to higher plain of self-actualization?